The Lord giveth and the Lord taketh away and so too, apparently, does MMP. The 10th iteration of its ASL magazine departs from tradition in two significant ways–one very good and one very bad. So how did MMP giveth and taketh? Let’s starteth with the positive. After well over a decade (longer, if one includes the run of its predecessor, the ASL Annual) of Journals that had their scenarios as pages in the magazine, with ASL Journal Issue Ten (J10) MMP has finally decided to take the scenarios out of the magazine and include them as separate cardstock inserts. Finally, players will no longer be faced with the problem of how to get Journal scenarios into their collection: do they photocopy them? Cut them out? Scan them? Other ASL publications, including Critical Hit Magazine, Schwerpunkt, and Le Franc Tireur had long ago adopted this method of scenario inclusion and it is gratifying that MMP finally saw the light. Better late than never; this is a significant improvement and ASLers should be grateful. Kudos to MMP. So, that was the good. That, sadly, brings us to the bad. Once more departing from a tradition that dates back over 20 years, with J10 MMP changed the paper on which the magazine is printed. J10 instead uses a thin glossy paper–the sort of paper one might find in People Magazine rather than previous issues of the Journal. 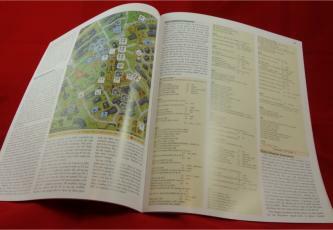 MMP has previously shown its fascination with glossy paper–using it to print most of its non-ASL maps and rulebooks, for example–but until now ASL players were largely spared. Alas, no more, it seems. Why does this matter? While the glossy paper renders color well (though so too did the previous paper), it has less of the sturdiness of its predecessor. The pages crease and tear relatively easily; owners of J10 will have to treat the issue with tender loving care, including getting a plastic protector for it so that it doesn’t tear or crease. The cover of one of Desperation Morale’s copies of J10 managed to crease within 30 minutes of opening. Here’s the difference between People Magazine and the ASL Journal: people buy People to read and throw away. People buy the ASL Journal to read and use and keep until they die and their wife sells their ASL collection on E-bay. Previous Journals were sturdy and could hold up to wear and tear; J10 seems almost disposable. And, sadly, it does. One can only hope that perhaps MMP will reconsider and, for future issues of the ASL Journal, return to the practices of the past. Aside from these two major changes, what else does J10 have to offer? It should be noted up front that, in terms of quantity, J10 offers its purchasers less than Journal Issue Nine did. It is about a third smaller in length (though keep in mind that scenarios now appear on cards), contains about a third fewer scenarios, and comes with no map, counters, or campaign game (it is, however, also considerably less expensive than Issue Nine). The article content of J10 is somewhat disappointing. Part of the reason for this is due to the inclusion of a very long Festung Budapest scenario replay, which takes up a major portion of the magazine: 21 of the magazine’s 48 pages! Scenario replays are quite popular among a large segment of the Journal’s readership, so one can’t argue against including a replay. However, this particular replay needed editing for length but did not get it (it is not until the 7th page of the article that the participants start discussing the first turn!). There are additional steps the editors could have taken to make the article more manageable. ASL’s long experience with scenario replays (in both official and unofficial publications) strongly suggests that very few people actually set up the pieces and follow the piece-by-piece play using the Replay Log. Not including that log would have saved considerable space. It is also true that including a series of “neutral comments” is a luxury that can be dropped if a Replay would otherwise be too long. Scenario replays work pretty much just as well with only comments from the two actual participants. Had this replay been half the length it was (or if the Journal had been much larger), it would have been an excellent article; as it is, it dominates J10 and if a purchaser happens to be among the people who do not care for scenario replays, then they are out of luck. The rest of the content in J10 tends to be short. Aaron Cleavin has a one-page article on the chances of rolling a sniper on low-odds shot (which, in one of those odd “small world” coincidences, was the same subject of a longer article that appeared a month earlier in Schwerpunkt Volume 18; neither writer had any idea the other was working on the same topic). 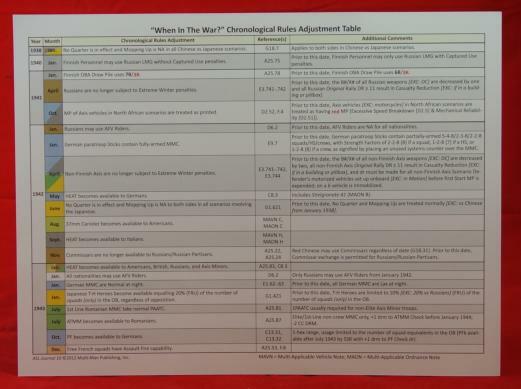 Spencer Armstrong contributes a “different sort of chronology of war,” which consists of a play aid which lists when during the war certain ASL rules/abilities come into effect. Bruno Nitrosso offers a “CC Simulator,” which tries to compute the odds of winning a CC combat, but may be of limited practical utility. One longer article is Robert Wolkey’s “The Beginner Blues, Part I,” which offers advice to newbies. J10 also includes something called “Son of Squad Bleeder,” put together by Bret Hildebran. Essentially, this is a collection of three semi-generic scenarios in which the boards, units and other factors are largely determined randomly or purchased, creating as much uncertainty and “fog of war” as possible. By their very nature, the scenarios (one set in the Soviet Union in 1943, one in France in 1940 and one in Burma in 1944) can’t be pre-balanced, so would not be used in a competitive setting, but rather are just for fun. It is nice to see them here, though perhaps these should have been printed on scenario cards along with the other scenarios. 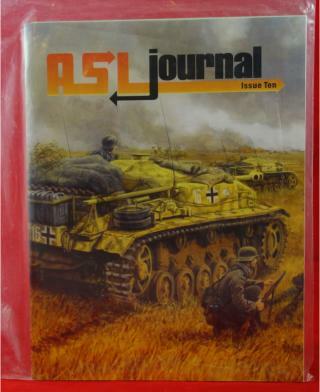 The magazine also has assorted bric-a-brac, including a Festung Budapest FAQ, a Festung Budapest play aid, and the usual issuing of ASL errata (including Festung Budapest errata) that now occurs with every Journal. It is perhaps worth pointing out here that it has been 12 years since the publication of the 2nd Edition ASL Rulebook and in that dozen years a huge amount of errata, some very minor and some not so minor, has accumulated. It may well be time for a 3rd Edition rulebook come out. Leaving aside the “Squad Bleeder” actions, J10 still comes with an impressive 17 scenarios. They stem from an oddly international mix of designers, who hail from the United States, New Zealand, Australia, Germany, France, Great Britain, Canada/Netherlands, and Switzerland. The actions themselves are also varied and include: Soviets vs. Germans (Stalingrad 1942, Latvia 1944), Americans vs. Germans (Belgium 1944 , France 1944 , Germany 1944), Chinese vs. Japanese (China 1937), Slovaks vs. Hungarians (Slovakia 1939), Americans vs. Japanese (Philippines 1941 & 1945), Canadians vs. Germans (Germany 1945), Soviets vs. Germans/Hungarians (Budapest 1945), Indians/Gurkhas vs. Japanese (India 1944 and Burma 1944), and British vs. Germans (France 1944). 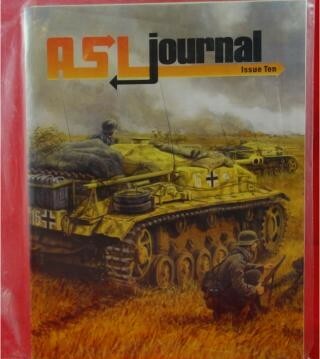 One of the early favorites to emerge from Journal #10 is J157 (Rage against the Machine), a Soviet-German scenario that teeters on the edge of tournament playability (it is probably a tad too large, except for speedy players). 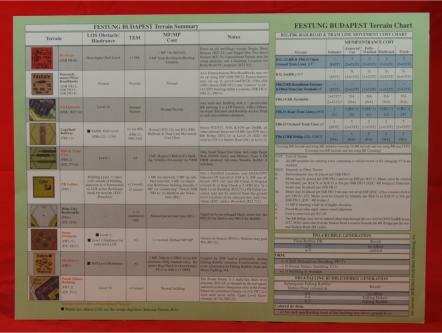 This scenario was designed by Peter Struijf and Chris Mazzei, who have contributed a number of scenarios to the Journal and to Friendly Fire packs in the past. The scenario is balanced and fun. They also designed a very interesting PTO scenario, J147 (Into the Grinding Mill), which features a large Japanese attack (including a flamethrower, DCs, and 5 tanks) against a fortified Chinese position. J159 (Tropic Lightning) is another meaty PTO scenario designed by the Bongiovanni brothers. It features a seriously powerful American force attacking a far weaker Japanese force, but the Americans face daunting victory conditions. J150 (The Sangshak Redemption) is a tournament-sized PTO scenario that might see significant play. A company-sized Japanese force have to attack a reinforced Indian platoon, then withstand a major counterattack by a truly nasty Gurkha force. 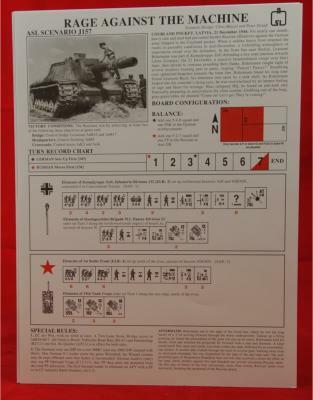 Unfortunately, another tournament-sized PTO action, J151 (Squeeze Play), though it features an interesting situation, is probably too unbalanced to play–the defending Japanese have too few forces to defend a fairly large area and the attacking British, who also have a flamethrower and 4 Lee tanks, can range across the battlefield causing havoc. The Japanese balance probably wouldn’t help them much, either (instead of the listed balance, players might try adding a Japanese 4-4-7). Pete Shelling’s tournament-sized J156 (Mageret Mixer) ought to receive a lot of play; not only does it seem balanced, but it includes one of the best SSRs in the magazine. In this scenario, the German player places four Pz IVJ wrecks on the mapboard (in pre-designated places). However, one of these wrecks–determined randomly–is not really a wreck and will “wake up” mid-game, perhaps to the dismay of the American player, depending on which of the wrecks wakes up. Shelling also contributed the more meaty J154 (Cradle to Grave), which features a mixed American/FFI (French maquis) force defending against a German attack (the “mysterious maquis known only as ‘Captain Clin'” mentioned in the scenario aftermath was actually Maurice Colin). Overall, the scenarios are a solid mix, with a lot of actions that are fun to play. This makes J10 worth getting, even if the thin glossy paper of the magazine is a major drawback. The Lord of ASL is displeased. Dark clouds gather over mount MMP. The cowled monks hold council to seek out the arcane knowledge that will allow them a new creation which doth give joy to the great lord. The people’s watch and the people’s wait.